Erich von Daniken's Chariots of the Gods is a work of monumental importance--the first book to introduce the shocking theory that ancient Earth had been visited by aliens. This world-famous bestseller has withstood the test of time, inspiring countless books and films, including the author's own popular sequel, The Eyes of the Sphinx. But here is where it all began--von Daniken's startling theories of our earliest encounters with alien worlds, based upon his lifelong studies of ancient ruins, lost cities, potential spaceports, and a myriad of hard scientific facts that point to extraterrestrial intervention in human history. Most incredible of all, however, is von Daniken's theory that we ourselves are the descendants of these galactic pioneers--and the archeological discoveries that prove it... * An alien astronaut preserved in a pyramid * Thousand-year-old spaceflight navigation charts * Computer astronomy from Incan and Egyptian ruins * A map of the land beneath the ice cap of Antarctica * A giant spaceport discovered in the Andes Includes remarkable photos that document mankind's first contact with aliens at the dawn of civilization. 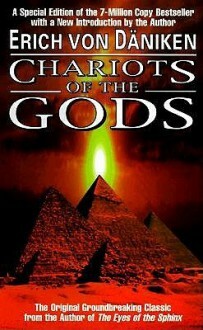 http://WilliamCampbellPowell.booklikes.com William's Book Blog 1.0 Chariots of the Gods? text Chariots of the Gods? I have to admit, I own a copy of this, signed by the author, moreover.It is pure bunkum, but it will deceive the credulous. If you see it, cross the street to avoid it. Buy a lottery ticket if you want to put your faith in something ridiculously unlikely. http://lauracrean5.booklikes.com lauracrean5 5.0 Chariots of the Gods : Was God An Astronaut? text Chariots of the Gods : Was God An Astronaut? 6-7 sene önce okumama rağmen bu kitabın beni bir hayli etkilediğini hatırlıyorum. Adamın öne sürdüğü tezler o kadar ilginçti ki uzaylıların dünyaya geldiğine ikna olabilirsiniz. Tam olarak bilimsel bir kitap değil, adamın teorileri bunlar ama yine de çok iyiydi.